Mother Nature has decided to go ahead and just lay spring on us with all her glory. 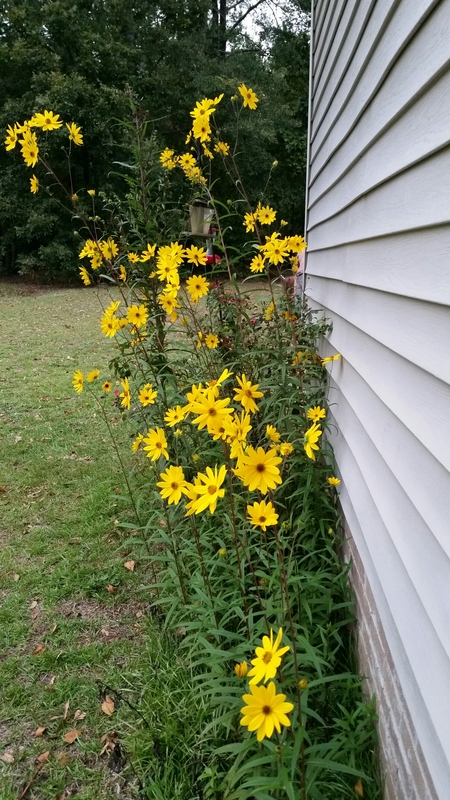 Even the not so glorious stuff….mosquitos, wasps, pollen, oh the pollen!! As much as I get frustrated with the usual nuisances I still have far more that I do love and enjoy about spring!! my vegetable garden with my girls, sitting outside on the patio grillin’ it up with the hubs (with a tasty adult beverage of course) and just watching nature wake up from this supposed winter slumber (if you even want to call it that). Fancified light saber according to my hubs. To start, I needed to draw out the general shape that I wanted for the wings to look. I would have been ok with just leaving them the shape they already were but I did not have enough room to do that. I just took one of my daughters crayons and drew out my shape. Sorry the yellow is so hard to see, guess it was a bad color for photographs. On the end of the wing that will attach to the post, I wanted to leave the one center hole so I did not have to drill a new one for attachment. On the opposite end of the wing, I just rounded it out a bit. I only did this with one blade/wing so for now. Now onto the cutting!!! I am so proud of myself….I used my husbands crazy jigsaw with no issues. I have never cared for this crazy thing….it is old and looks like it is about to fall apart when in operation. But I have to say I was rather pleased with how smooth it cut. Anyway, once I removed my “waste”, I used the cut wing to trace the shape onto the other three blades/wings. Once traced, I went ahead cut the others into form. Afterwards, I did need to do a light sanding to just smooth out the edges. All of this cutting and sanding only took me about 20 minutes. Time to paint!!! The fun part for me by far!! I decided to only use acrylic paint, since it dries quickly, cleans easy and has held up pretty well with other projects that are exposed to the elements. For my base coat, I just used a basic white acrylic paint. I applied two very light coats, I wanted to keep the worn and faded type look on this dragonfly. After a couple minutes of drying time, I just drew on some rough sketches of designs that I wanted on the wings. I was not worried about being symmetrical with the designs at all, just simple free-handing. Then I just traced/painted around the general area of the sketches….I made small changes or corrections as I went. The pencil marks are so light that I was not concerned about it being seen that I did not follow my lines. You can just call me the Kindergarten Rebel…always wondering outside the lines. Ok…lame joke, but hey my kids thought it was kinda funny. Moving on, hehe…. I was originally going to leave the table leg white, but decided I needed more color for my garden area than just white!! So, I just taped off the one small section I wanted to leave white, and went to town with spray paint!! I used the brightest spray paint I had, my lime green (that I recently used for the bathroom tray I made) and grape purple!! Clamped my leg to the table and sprayed on some light coats. Now to just let that dry…..
……fast forward about 2 hours, I am good to go to on moving to my next steps. Attaching his wings for flight!! Again I just did my usual…eyeballing…where I want my wings attached. I arranged my wings in the way I wanted them to appear on the dragonfly. For easier attachment, I just overlapped the holes with its neighboring wing (in picture above) and predrilled where my screw was going to be inserted. ***Side-note***Always try to make sure you predrill…this will help avoid any unnecessary splitting of the wood***. I did add a washer for extra pressure on the wings since two wings shared the same screw. Knowing my girls they will go over trying to make the wings move, so I wanted some extra pressure to deter them from turning it into a toy!! So now how am I going to display it?! Hmmm….after a ton of moving around and adjusting I decided to just go ahead and attach it to our split rail fence. But what about the more appropriate picket fence in the background? Nope not ours…our neighbors…different story, different day. Trust me, I was tempted to attach it to my neighbor’s bigger picket fence, I mean really would they have noticed?! They never come around here….hmmm….no, I will be the good neighbor and just attach it to ours. Well after searching the house, my husbands garage and shed….I didn’t have anything….literally N.O.T.H.I.N.G.!! Really we so much other crazy mess and I didn’t have anything to work as a hanger!! Then I remembered one of those crazy hacks from Facebook….soda can tab!!! I didn’t have any old cans in the trash or anything to get one, oh but I did have some soda in the fridge! Anyone thirsty?! Oh well, guess I will drink it…I need the tab. So I popped off this handy little tab, and attached it to the back of my dragonfly. Again I used a pair of washers, one on bottom and one on top to pinch the tab. Since it is aluminum, didn’t want wiggling too much and just snapping in two. Good thing is this dragonfly is fairly light in weight, so this will hold up pretty good without much stress. Pop a nail into the rail of the fence and BAM, hang it up and enjoy!! I did strategically place it near the post and this old warped rail. It is also helping in supporting the dragonfly. I’m pleased with how it turned out, but it is a lonely little dragonfly….hmm…going to need to add some more little pops of color over here. Going to have to come back and check out what else I am going to add!! !